Samuel Martindale [age 80 - born 14 Jan 1752], resident of Moore County, NC] applied for a pension and stated that he entered the service in Apr 1776 in Kent County, DE. After his service he migrated to Augusta County, VA and then in the Fall of 1777 he moved to Duplin County, NC where he was drafted by the NC Miltia. In the fall of 1779, he moved to Anson County, NC, in 1781 back to Duplin County and in spring 1792 moved to Moore County on Deep River. Acquainted with James Gaines, Brian Boroughs, Archibald Sheals, Neill Sheals and Daniel McNeill. Jesse Seawell, a clergyman, and John Cheek submitted affidavits of support. William Martindale v. Nancy Martindale and others. 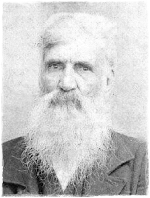 Appearing that Joseph Pearson and wife Eleanor and Thomas Martindale have been advanced land in their lifetime by Samuel Martindale, and that Betsy Culbertson and all of her children are dead without issue they are not entitled to a share in the partition of the land of Samuel Martindale, Dec'd. on Deep River. Jeremiah Phillips, Robert L. Purivs, Bradly Brady [Big], James Cavines and Powell Person appointed to divide the lands of Samuel Martindale Dec'd. and allot William Martindale 75 acres where William Martindale lives and all other land to Nancy Martindale. Jeremiah Phillips, Robert L. Purivs, Bradly Brady [Big], James Cavines and Benjamin P. Person appointed to divide the lands of Samuel Martindale Dec'd. for his children William Martindale and Nancy Martindale in the following manner: [Lot 1] 75 acres to William Martindale located on Cedar Creek [Lot 2] 326 acres to Nancy Martindale located on Cedar Creek excluding 50 acres within the bounds that were deeded to James Moore and wife Elizabeth by Samuel Martindale. Family History of Kidd, Brooks, Martindale and Brewers as described by Martha Kidd Williams. Can't verify the accuracy of all of the information but it is a good starting place as much of it can be proven through other sources.